The battle against the Joneses. A Princeton study last fall showed extra income didn't affect most people's happiness above about $75,000 a year. Another study by Gallup found the happiest people in America earn $120,000 a year. These folks may be happy. Just don't call them rich. Survey after survey shows many Americans wouldn't consider themselves "rich" until they had a net worth of $5 million-$10 million. British publisher Felix Dennis says you aren't rich until you have at least $150 million. Russian oligarch Sergei Polonsky says anyone without a billion dollars "can go to hell." The question over what's considered "rich" became important a few years ago after some politicians suggested anyone making more than $250,000 could afford a tax hike. Plenty found this absurd, and perhaps rightly -- what $250,000 buys varies wildly depending on geography. A quarter-million bucks in North Dakota buys a ranch. In New York City it (literally) buys a parking space. Those earning $250,000 a year might not feel rich, but in reality they're in the 97th percentile nationwide -- they earn more than 97% of tax filers. Objectively looking at the data without considering what earning $250,000 feels like, it's hard to call that level of income anything other than … dare I say … rich. Most who scored higher than 97% of the nation on a test would consider themselves smart. Those who run faster than 97% of everyone else would consider themselves in good shape. Income is an oddity in that many of those statistically near the top still feel inadequate. Daniel Gross of Slate put it more bluntly: "For those of you making more than $250,000, I regret to inform you: Yes, you are indeed rich -- any way you slice it." Why so many disagree with that statement could also be explained by this chart. What's important is how flat income distribution is until you get to the upper-90 percentiles, where the slope explodes skywards. Affluence is an enormously subjective measure. The field of behavioral finance shows that the feeling of wealth isn't based on how much money one earns, but how much money one earns in comparison to peers. Michael Shermer, author of Mind of the Market, points out that most people would rather earn $50,000 when the average is $25,000 than earn $100,000 when the average is $250,000. Similarly, the increase in how wealthy additional income makes us feel has less to do with the amount of income than it does how many of our peers that additional income pushes us ahead of. 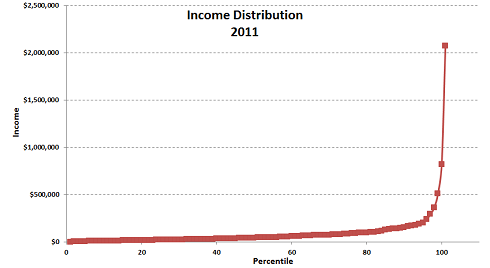 The flatness throughout most of the income distribution gives a huge boost to this phenomenon. If someone earning $35,000 a year doubles their income to $70,000, they move from the 43rd percentile to the 67th percentile -- a massive move that pushes them ahead of many peers. They've gained social ground. They feel much better off. But then the slope explodes. If someone making $250,000 doubles their income to $500,000, they move from the 97th percentile to the 98th percentile -- almost no gain at all. They may not surpass a single peer even after doubling their income. They don't feel better off because, socially, they're not. The upward climb becomes more onerous from there. Increasing your income from $800,000 to $2.1 million pushes you from the 99.5th percentile to the 99.9th percentile. Financially, you're making millions more. Socially, you've gained almost no ground whatsoever. And remember, it's the latter that guides how rich you feel. Jason Zweig, in his excellent book Your Money and Your Brain, shows how powerful this can be. In a survey of 800 people with a net worth of at least $500,000, 19% said that having enough money was a constant worry. For those with a net worth of at least $10 million, 33% felt this way. "Somehow," Zweig writes, "as wealth grows, worry grows even faster." That, more or less, is why those making $250,000 don't feel rich. It's not that they don't earn a lot. It's that passing new social hurdles becomes so difficult that relative wealth -- all that really matters -- declines. To paraphrase Pablo Picasso, they're poor people living with lots of money.